Fair season allows exhibitors to showcase their best dairy cattle, including ones made out of butter. Dairy cattle come in all sorts of shapes, sizes and colors, but have you ever seen the ones you can spread on toast, or perhaps, a baked potato? 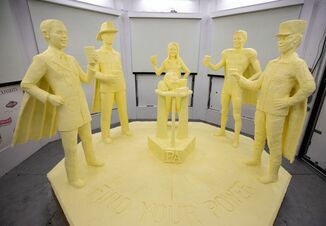 If you have ever had the opportunity to visit the dairy exhibit at your state fair, chances are you have probably come across the annual butter sculpture. Taking days to build and usually weighing more than 600 lbs., these iconic fair items typically represent the theme of the fair along with the hard work farmers and processors put into creating the sculpture’s building material, butter. If you haven’t had the chance to see some of these creations, scroll down to check out a few of this year’s butter sculptures across the country. Getting her first driving lesson, this 600 lb. butter cow is featured at the Missouri State Fair. Celebrating the state’s “bicenntenial” year, the butter sculpture at the Illinois State Fair features a grand champion cow shown in the Land of Lincoln. Unfortunately, butter does not come with a spell check feature, as bicentennial was spelled incorrectly on the animal’s banner. The error will be fixed before the large crowds visit the dairy building this weekend. In celebration of John Deere's 100th anniversary, the Iowa State Fair’s traditional butter cow stands alongside a Waterloo Boy tractor sculpture this year. Spending more than 400 hours sculpting scenes from the 1983 film “A Christmas Story,” which was partly filmed in Cleveland, the Ohio State Fair brought a bit of Christmas in July to the dairy building. Several states have not yet hosted their state fair this year. Check out some of last year’s butter sculptures below. On opening day at the Minnesota State Fair, the newly crowned Princess Kay of the Milky Way has her likeness carved in butter. The sculpting continues throughout the fair with the other 11 Princess Kay finalists serving as models for butter sculptures. Paying tribute to 100th anniversary of the founding of the New York State Police, last year’s butter sculpture depicted three state troopers visiting the fair’s dairy exhibit. #ThrowbackThursday to last year's NY State Fair where the butter sculpture was named "Dairy Farmers' Tribute to New York State Troopers". Taking nearly 1,600 lbs. of butter and 85 hours of work, the Kansas State Fair butter sculpture featured a young girl hauling her first-place pumpkin with a tractor.